As part of our study on the grain food group, we made homemade bread. 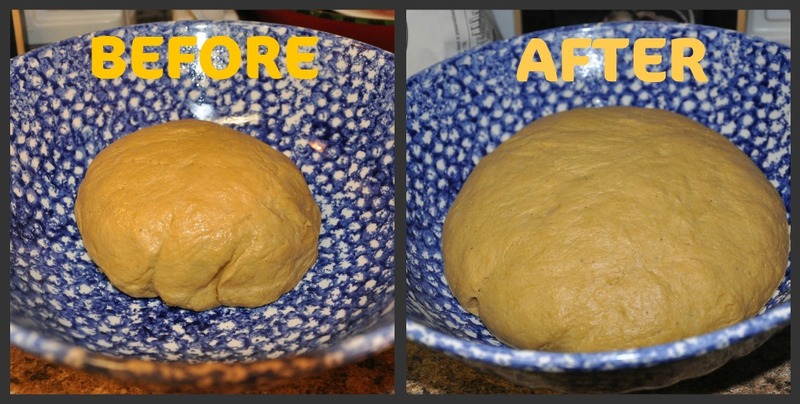 We used an awesome recipe for Anadama Bread from Family Fun magazine. I'm so thankful for my friend for telling me about it. Rachel helped with measuring the ingredients. It's hard to see in this picture but it was cute to watch her scoop the ingredients because she was so focused on what she was doing that she didn't realize that she opened her mouth wide each time she scooped. It was a little messy but she is such a good helper! Nicholas was chomping at the bit to help too so I let him measure the salt since it required a little more control. Again, Rachel was very focused watching big brother do his task. When Nicholas raised his arm up to pour the salt, Rachel subconsciously raised her arm up too! Isn't that funny?! We mixed up our cornmeal, salt, and water to make a mush. We simmered the mush in the stove for just a little bit until the cornmeal thickened slightly. We put it back in the mixing bowl. ...and Rachel poured it. I love how my kids have so much fun in the kitchen with me but I do have to be sure to divide up the tasks equally or lips may pout. We added the molasses and butter to the bowl of cornmeal mush and stirred. Then we let it cool off for about 10 minutes. Next, we talked about the wonders of yeast. I explained that the yeast is active and alive but it is packaged in a dormant "sleeping" state. Nicholas sprinkled the yeast over a 1/2 cup of warm water to help it wake up. We watched it for about 10 minutes as the yeast started getting foamy. I jokingly said that I could hear them all waking up and yawning and Nicholas put his head down to listen! Hee hee! Then Rachel stirred the yeast into our cornmeal mush. We used the mixer to slowly beat the flour into the cornmeal. 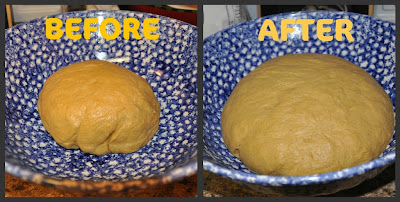 Once the dough was forming a ball, Nicholas pulled it out of the mixer and put it on a floured surface where he and Rachel kneaded it for 10 minutes. It's good to have helpers! We let the dough proof for about an hour and half while we went to play at the park. Here was our results when we returned home. Nicholas loved the next step where he got to punch down the dough! Then my little team kneaded the dough on the floured surface again for about a minute. We used a rolling pin to shape the dough in a 12x9 rectangle then we rolled it up along the shorter end and put in the buttered 9x5 loaf pan. Nicholas covered it with plastic wrap and we let it proof again to double its size for about an hour while we worked on an art project. Heat oven to 400 degrees with the oven rack one level below the center,remove the plastic wrap from the pan and place the bread in the oven. Turn the heat down to 375 degrees. Bake the bread until it starts to brown, about 30 minutes, then rotate the pan 180 degrees and bake for an additional 15 minutes. Remove the bread from the pan and let it cool thoroughly on a rack before slicing and serving. The waiting to cool is definitely the hardest part of this recipe.